I cannot open this document....anyone else having troubles? Help! Mine opened just fine with the Silhouette Studio software. Thank you Dawn, You are awesome! I went to the Silhouette store when you mentioned using your Cameo but quickly realized that you must have design this fishing vest your self. Thank you! so much. I love your fishing vest. AWESOME Dawn, thank you! This will be perfect for my brother's birthday card!! So very kind of you. I don`t have one, but I am sure lots of girls will enjoy it, it is fabulous! I'm also having trouble opening the file. Dawn what software do we need to open? Thanks so much. Please Note: this is a .STUDIO file for use with the Silhouette Cameo electronic cutting machine. You will need Silhouette Studio software to open and use. If you guys would like it in .PDF or .AI file formats, for hand cutting or other devices just let me know. Thanks! Hello Dawn, may I please have the PDF version, I do not have a silhouette cameo. You can find the link at the very top of this post to download the .PNG, .STUDIO, .AI, .PDF, and .SVG files. Thanks! so would love a PDF because this is SO perfect for my hubster!! Hi Jana! Is it still not working for you? I checked it and it worked properly for me. Did you try the zip file instead? The zip file worked for me. I still can't get the other link to work. I am not sure why. Beautiful creations...thanks for the template! Mannnnnn I read all the blog posts here and I'm super addicted to wplus9 stamps now! I just bought a second-hand set of the folk floral and I can't WAIT to stamp with it! I just love this design- just received my fish stamps and had to scrap lift this fish vest project to try them out asap...thanks so much for the wonderful inspiration and cut file. Thank you so much for the vest cut file.. this is too cute. Love it Love it.. THanks very much for sharing this cute file! This will make a great "guy" card. Unfortunately I am computer illiterate and can't open it. Is there any form that could be e-mailed to me? alpapa@charter.net Thanks for sharing your talent. This file is awesome and my grandson will love the card I will make from it for him...Thank you so much for being generous and sharing with us. I appreciate it. Thank you for this great file. Thank you so much for posting a pdf file! I was just asked to make a card for someone who likes fishing and hunting and this will be perfect to use! The ZIP file (linked at the top of this post) includes the following formats: .PNG, .STUDIO, .AI, .PDF, and .SVG files. Thanks so much for the PDF, PNG & SVG! This is just what I was looking for! This is just marvelous, Dawn! Thank you ever so much for sharing your hard work with us. 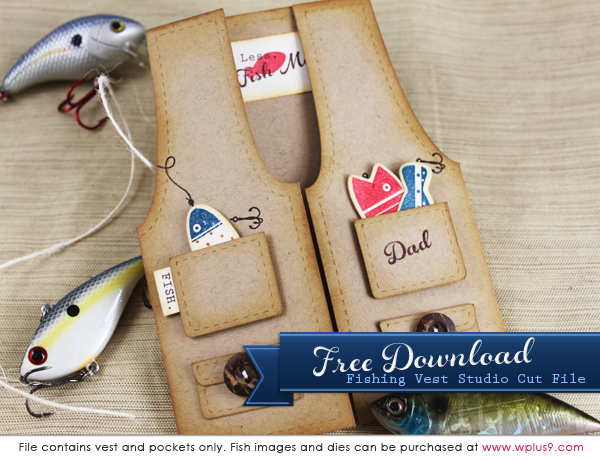 Hello, this fishing vest is great, but how pity the download link doesn´t work. Would it be possible to get file nevertheless? Just came across this card on Pinterest and would love to make it except when I click on the links, I keep getting errors... would you mind sending me a copy to file. Me again... Sorry I should have mentioned that I don't have a Silhouette Cameo but to have a Cricut... Not sure if you have a file for that or just a pdf would be fine & I can cut it out myself!! Hi, would it be possible for you to send me the SVG files for this please - My Mail : yurika_yume@hotmail.com thanks !